Has your hair been feeling flat, lackluster, or just dry and damaged from the fall weather? If you’ve been making regular salon visits, but your hair is still “Eh” it might be the products your using. 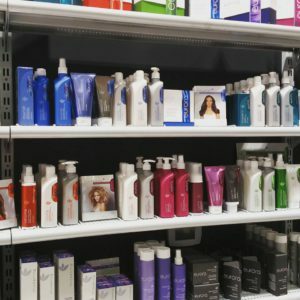 Drugstore and shady website’s hair product selections (while seemingly massive) aren’t guaranteed to be the best from that brand. These hair care products are sometimes expired and frequently aren’t even the correct product! Buying your hair care and styling products from a salon ensures your hair is getting exactly what it needs. Let us explain why. We have all the hair care products you need at Charisma Salon Detroit! When you buy salon products from a box store you’re not guaranteed you’re getting what you pay for. There have been several investigative reports that have found expired, low quality, and misleading products being stocked on shelves and sent to your home. Since these outlets aren’t required to keep reliable and safe products in stock, you end up paying for it. Ordering off Amazon doesn’t ensure that you’re buying the product that your paying for. Buying directly for a licensed and certified salon helps ensure that you are getting exactly what your hair needs and what you pay for. We love to help our clients get the best products for their hair types and hair needs, which Amazon can’t give to you. With the holidays coming up, we wanted to remind everyone to remember to book their appointments in advance. We book up very very quickly during the holiday season, so make sure to book your appointment in advance!